Depending on the condition of your beach, the amount of muck or weed growth, preparation can range from none to quite a bit. The optimum time for installation is on or before Memorial weekend. This is before significant weed growth has begun. If your beach has less than 3′′ of sediment and is relatively debris free (such as sunken limbs, logs, clumps of dead weeds, etc.) no prep work is required. However, if you have a beach which has not been used for swimming or has had little boat activity or has bulrushes, cattails or lily pads then some prep work is required. Begin by removing sunken debris from your permitted area. Anything that would obstruct the path of the chains on the arms of the BeachGroomer. In early spring when the water is clear you will see this debris. The good news is you only have to do this once. If lily pads are present in the permitted area this is usually an indication of a soft bottom. However, in early spring the lily pads have not yet grown but their rhizome root structure is well established. These tubular roots can be raked free of the bottom. Once freed these large roots will float. Please dispose of these properly and only remove these roots in your permitted area. As mentioned earlier there is very little weed growth before June but there may be dead weeds from the previous summer still rooted (much like plants in a garden that have died). These should be removed. Light debris such as leaves and small twigs do not need to be removed as the BeachGroomer will sweep them clean. If you plan to install your BeachGroomer System later than the beginning of June, you will most likely have to rake your area before installation to ensure proper function of the BeachGroomer. 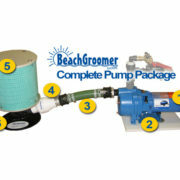 Many beaches require no prep work but even on virgin beaches with the proper preparation one can have a sandy beach and the bonus is after the first season of using your BeachGroomer the following seasons require no prep work.